I don’t know if a picture of Leon exists? 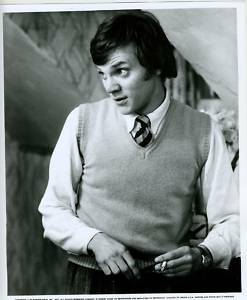 I always thought he looked like Malcolm McDowell, which is why I’ve included a picture of him (above), to give you an impression and set the scene! This picture of McDowell is very Leon. My first memory of Leon was the two of us sitting in the back of a London taxi one dark, wet winter’s night in 1972/3. We were late, as per usual, travelling from Ricci’s George Street salon to the King’s Road salon for model night. He was a well seasoned hairdresser, probably at his pinnacle and I was a n00bie Junior in my renaissance. We talked of my progress, he casually told me not to worry and that I’d do well. I was hanging on to his every word, but by his tone I knew he didn’t care. Leon talked as if I wasn’t there, he soliloquised about ‘creating The look’ and ‘bringing out a client’s personality’, his lofty words floated way above my head and I struggled to take it all in. Unfortunately our ‘conversation’ was cut short by our arrival and we didn’t ever talk of such things again. I moved to the King’s Road salon and after a short time Leon left Ricci Burns. I asked Tina if she had any memories (I nearly wrote mammaries – Freudian slip) of Leon? Tina replied, “Once, Leon was finishing his 5 o’clock client and Reception were getting his client to pay so they could cash up. When they presented her with the bill, Leon noticed that her name was Mrs. Odsog, and proceeded to start giggling as he had recently had a ‘smoke’ and he found her name hilarious. It turned out that he had a friend who had a cat called Odd-sock and he told the client! She wasn’t amused at having the piss taken out of her!” And I thought, oh yeah – That was so typically Leon! Skip forward a few years until about 1980/81; I’d been to Paris to do a fashion show and photo session, on my return I ended up in Windsor waiting for a lift home – I think. Anyway, I was in Windsor, looking around, killing time – And there he was, Leon, standing outside a hairdressing salon (Chess-Set, Church Street, Windsor) having a smoke. He greeted me like a long lost friend, eager to hear of past times. He looked totally out of place to me. And we became friends for a short time – maybe for four or five years. We would normally meet-up for lunch and sometimes we’d swap haircuts. We talked of old times, and apart from the drugs, we discovered we had had carbon copy career paths – almost. But, Leon Hamme, my creative role model, was now on a downward spiral. He floated from salon to salon, Chess-Set, Cassidy, the Holiday Inn, he was freelance, he was probably on heroin! And the last I heard of him, was that he was going to do a film – 1985 Max Headroom (TV movie) (Leon Hamme: assistant hair stylist)! Fast-forward to Tuesday 26th November 2013, I’m reading the news and I see, Where fantasy ends and reality begins: Unnerving images show multi-ethnic women digitally merged with Barbie dolls – Epiphany. There it is, a photograph that makes clear Leon’s dream like soliloquy. Sheila Pree Bright’s ‘Plastic Bodies’, like Katie Piper, transcend what most people think of as real beauty and asks us to look at the individual within. We all have a complex range of ideas of what Beauty is, these ideas are mainly foisted upon us by the commercialisation of society – I think that the Barbie doll itself, is a perfect example the false, airbrushed, synthetic, siliconed and plasticised world we live in. And Sheila Pree Bright’s beautiful and fascinating images give us all a slap around the face and say Wake Up – They did to me anyway! Hair colourist Lester Baldwin once said to me, “Leon Hammé is the world’s best hairdresser by far.” I don’t know the final part to his story, I’m pretty sure he popped his clogs in the 1980s! He certainly had an inner beauty and he was way ahead of his time. This entry was posted in Fashion, Hair Philosophy, News and tagged Church Street, Holiday Inn, inner beauty, King Road, Leon Hamme, Lester Baldwin, Paris by ian. Bookmark the permalink. I have a picture of Leon, and will send it to you if you would like, taken summer 83 at my sisters 21 birthday. Group photo. I knew Leon in the 80’s. He was cutting hair out of his flat in Windsor, including mine and my mothers. Always had a small joint in his gob as he cut. Don’t think my mother ever realised. Like you, I felt Leon had a distinctly “not quite belonging to anywhere or anyone” prescence, certainly not Windsor, he was so cool and laid back. He shocked us all by announcing he was moving to the south coast. Kent or Essex I think. That must have been about 1990. I moved overseas in 92 and am still out of the U.K.
Thankyou for posting a tribute to someone who is unforgettable. I can get the snap made into digital if you like and e mail it to you. Hi Howard, Yeah, we used to swap haircuts in his Windsor flat. A small joint – for years! Is this the Leon Hamme that grew up in Hendon Barnet and whose father was the local Baker? I don’t know anything about his father, I think his mother lived in Brighton. The last time I heard from Leon was late in 1992 or early 1993 when he was working in the Southend area. I moved house and unfortunately he did not have a mobile at the time. He cut my hair brilliantly for many years and I would love to know where he is now. His father died in the early 1980s and his mother used to live in the Southend area. If anybody knows where he is, I would love to know.